If you've ever lived in Birmingham, you'll know about the number 11 bus route. It circles the outer areas of the city centre, and transports those to areas that aren't quite the cream of the Birmingham crop. The bus, which has doubtless been the scene of drama over the years, now has a play set on it. 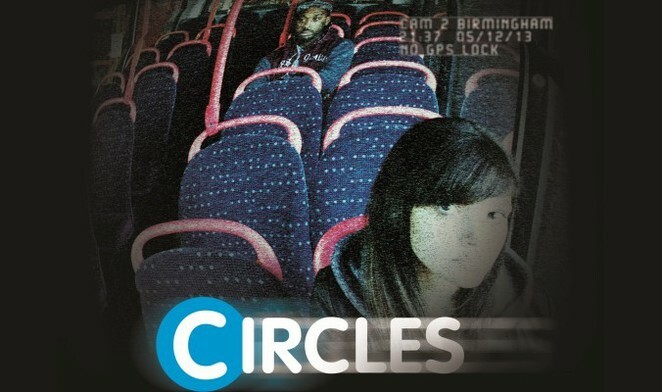 Circles, by Rachel Delahay, is about love, trust and breaking cycles of violence. This play really hits home because I've known people who live in the areas which circle the city, and heard of the violence which has taken place. I recognise the seating, the colour scheme and the fear in the actress's eyes in the poster. For a play like this to even take place, as somewhere as prestigious as The REP, is a huge achievement. The play will hopefully pave the way for change. Call me a dreamer, but only when issues like violence are discussed, do we take a step towards obliterating this issue altogether.